After feedback on the format and number of players finding availability for the chosen date difficult we have decided to change the format for Worcester War 4. 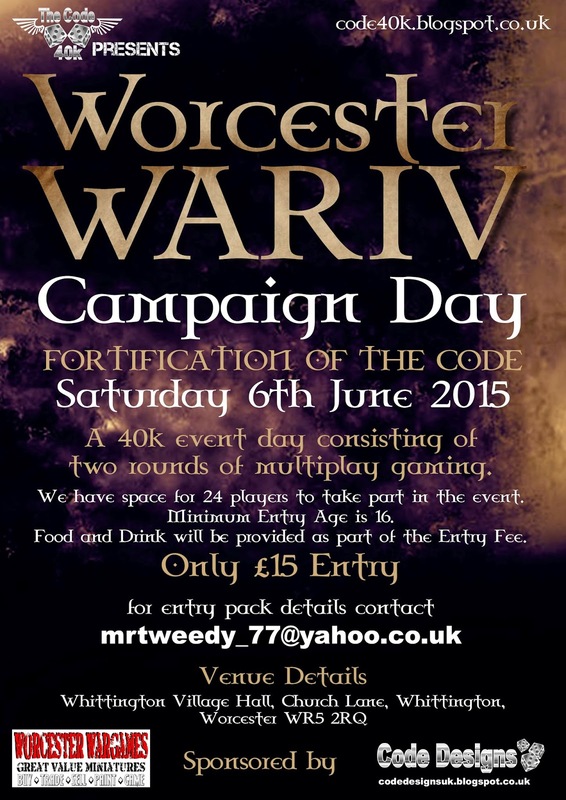 The code40K team present our fourth event: Worcester War 4, “Fortification of the Code”. 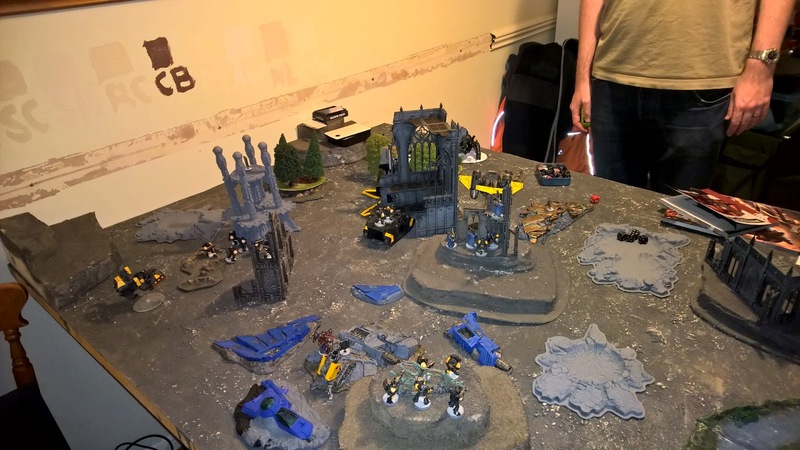 We have space for up to 24 players who will form two teams; Good and Evil, these teams will compete in 2 rounds of 7th ED 40k working in pairs or alone depending on numbers and to be determined on the day. 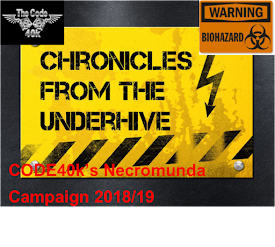 You will be attempting to gain control of secret data packets hidden in an abandoned underground complex in order to provide your forces with an advantage in the final event in this story; “Assault on the Code” which will be held sometime in 2016. This event follows on directly from the events played out during Worcester War 3; please note participation in WW3 is NOT required for entry into this event. 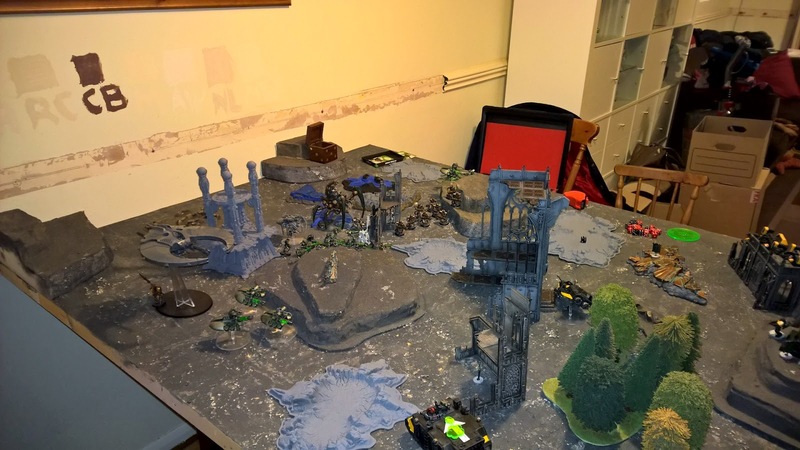 Worcester War 4 follows on directly from our last event, Worcester War 3, which saw a widespread conflict spread across the 5th planet of the Lentarum system; a backwater Imperial colony near The Maelstrom in the Ultima Segmentum. The day saw 24 players fight for dominance and control of a psychic beacon which had sent a mysterious signal throughout known space. 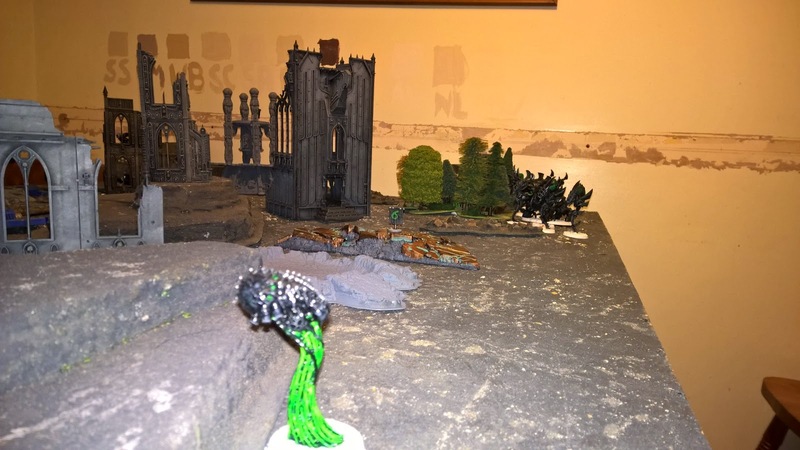 In the end the beacon was claimed by the forces of chaos in the form of a Nurgle Daemon force! If you're interested in joining us, the event is on Saturday 6th June 2015 at Whittington Village Hall. Entry fee is £15 and includes lunch and refreshments through the day. Please e-mail mrtweedy_77@yahoo.co.uk to check if places are available and sign up to take part. The deadline for entry is Sunday 31st May 2015. 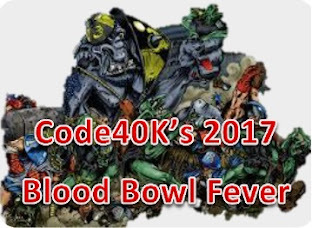 Time for The Code 40K Gaming event! Now the war rages on and the forces of Good are ready for one final push! 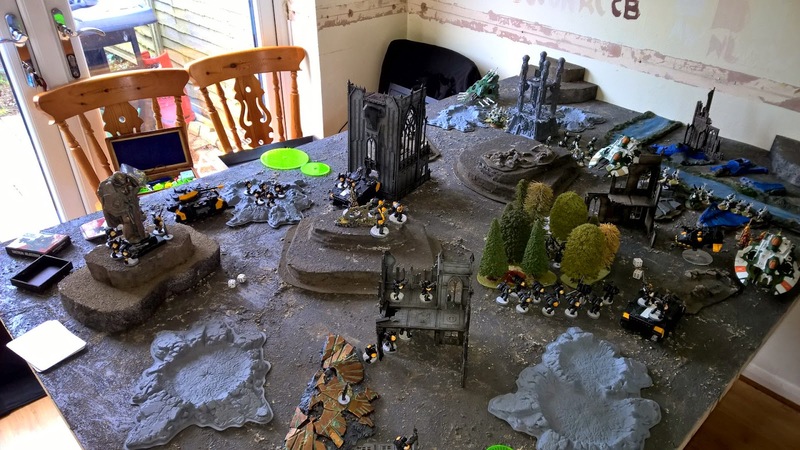 Worcester War 4 will see the final assault on a heavily defended position, held by the forces of Evil!! by an alliance of Good forces. 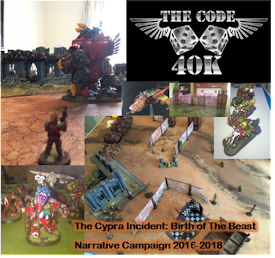 We will be playing a single massive multi player game of 7th Ed 40K, over a large C shaped board made of 9 standard 6' tables joined end to end. 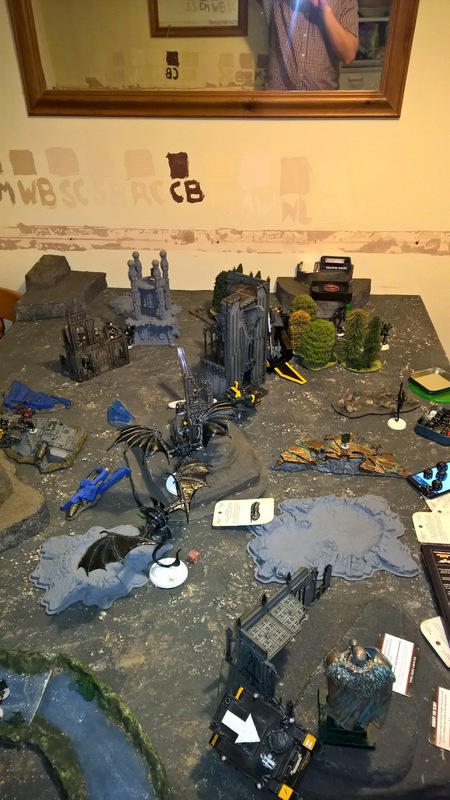 You will fight either for Good or Evil over this defensive perimeter and then the game will culminate on a 2nd table representing the primary objective. Events on the perimeter will directly effect your chances on the final objective. 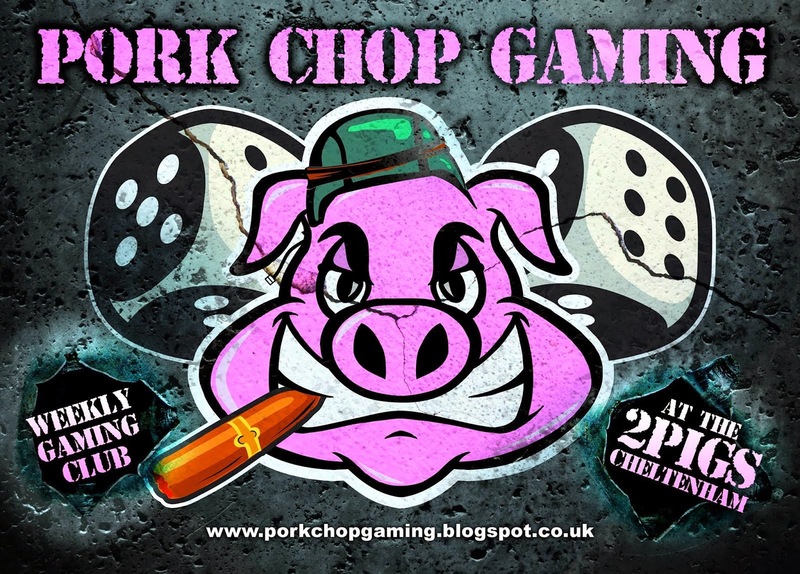 We have space for 30 players, if you're interested in joining us, the event is on Saturday 6th June 2015 at Whittington Village Hall. Entry fee is £15 and includes lunch and refreshments through the day. 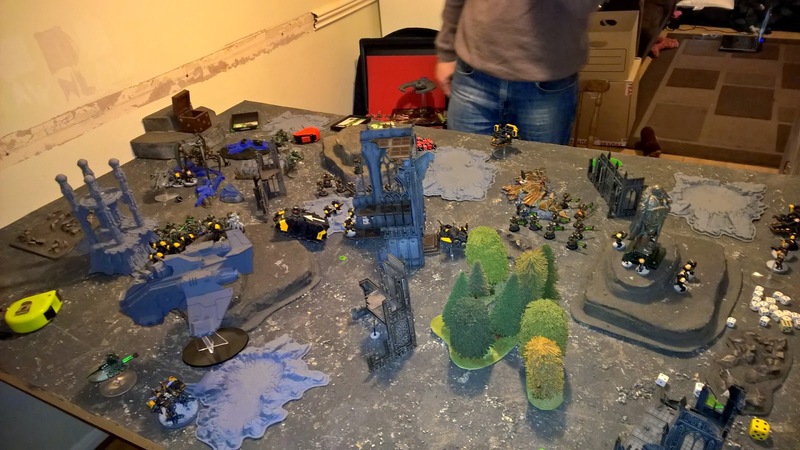 This time I am taking on Alex_H and his NIds. It has been a while since we had played and this is our first 7th game. We played 1500 points. I am a big fan of this value. 1. It allows plenty of chat throughout the game and still be finished at a sensible time. This game took 5 hours! 3. There is so many rules to remember in 7th and trying to keep track of what is going on you need to keep it as simple as possible. I had chosen 3 lists initially so I could choose which to take at the time. 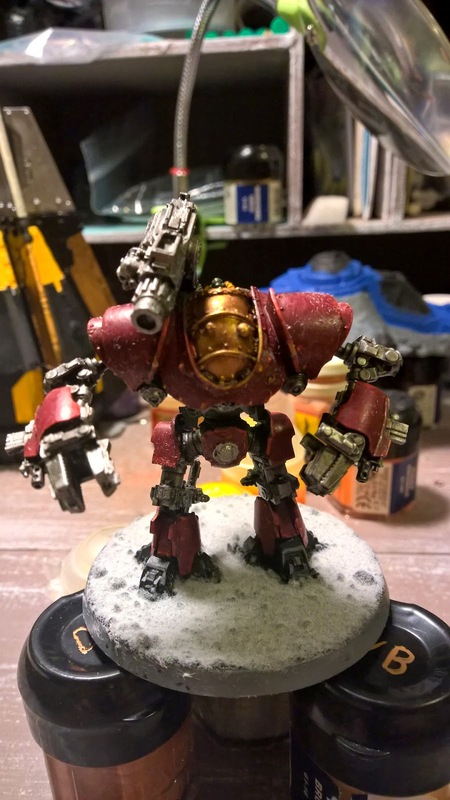 The first was based on my unbound terminator list from a few games back. 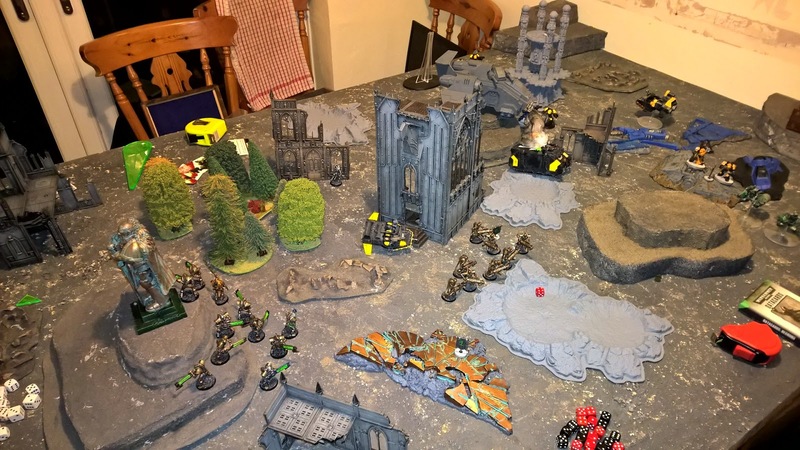 This time I used the Dark Angels codex with Belial, a librarian, 5 DW Knights, 2*5 DW and 1*10 DW. 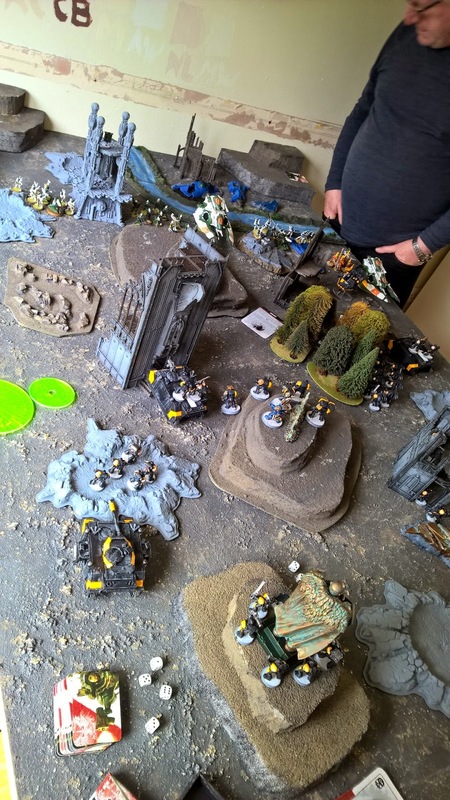 It looked good and if I was playing the emperors will missions then I think would have had a chance, but playing Maelstrom I did not have enough units or manoeuvrability to cover the board. Also I had no flyer protection (in hindsight I may have worried about that too much). As you can see the basic minimal troop choices, and they don’t even have objective secured! I was not really expecting such a small force. When I think of nids I normally think loads of gribbly stuff supported by some fancy big stuff. As Alex and I had played a few game recently we decided on a mission neither of us had played, Maelstrom 4. This had an interesting twist where both you and your opponent can claim tactical objective “secure objective X” when they are in your hand! The newer codexes will be at a slight advantage here as they only have 12 of those and 24 other ones where using the one from the books there rae 18 “Secure Object X” cards. As we both have an older codex it levelled out. Again I am not going to give a turn by turn report, but here are some of the main highlights. 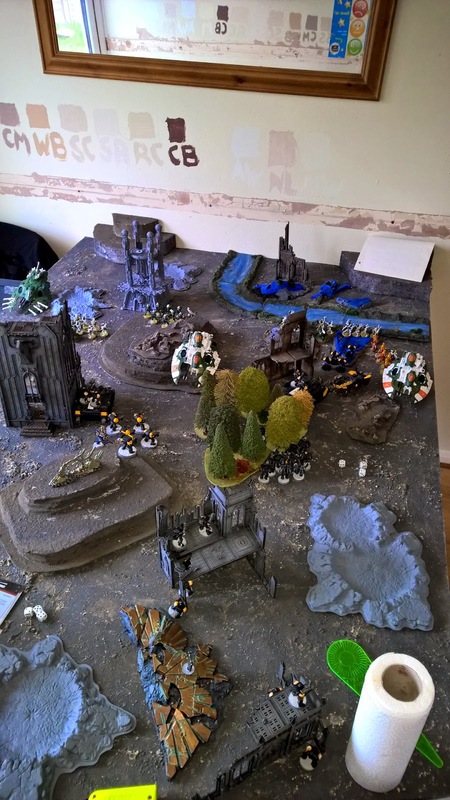 · I set up with the heavy stuff at the back. 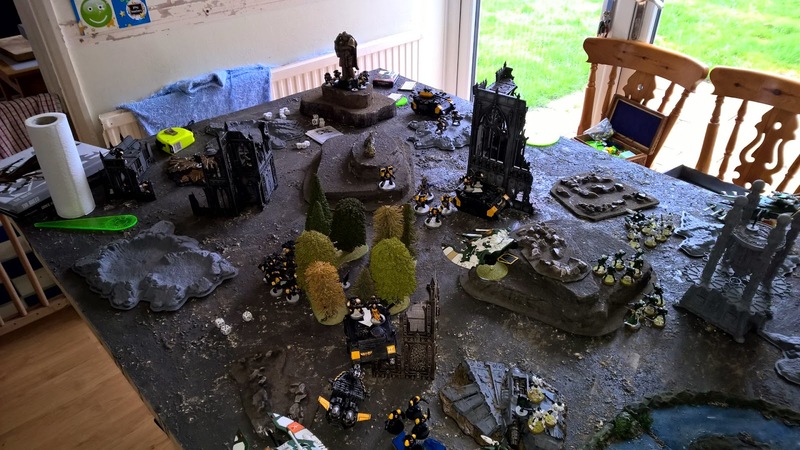 The idea was for the scouts to infiltrate up field and the 2 tactical squads (the assault half) would get forward for objectives on the other side. 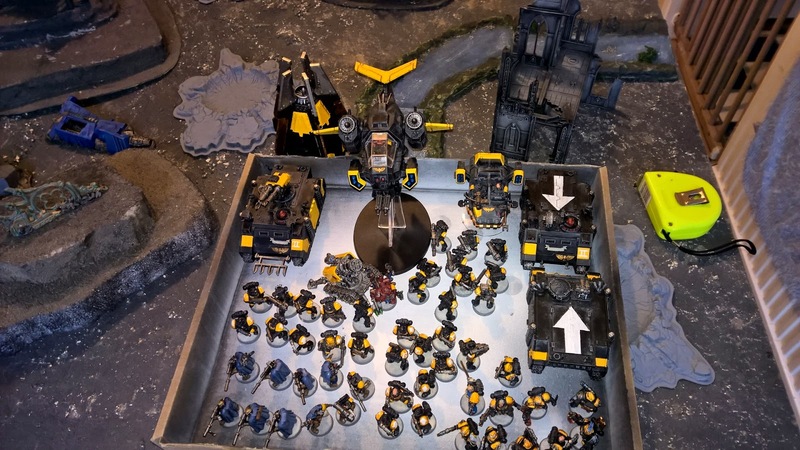 · Initially forgetting about the sternguard! But when they came on they were OK. Helped kill a squad of zonethropes for first blood. There second round of shooting against the Exotrine with only 2 wounds left....5 grav gun wound and he made all 5 of his 5+ cover saves! 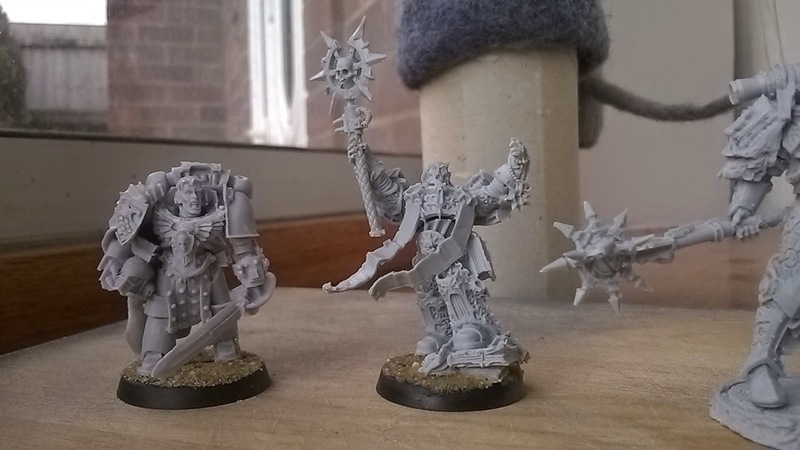 · The librarian was poor but a cheap HQ choice. I am not sure what other option a marine player has. The others are more points, and a captain needs even more points to make him useful. The librarian did get shrouding off once but failed a perils test, and eventually died. He is a bit of a soft VP for slay the warlord and also some of the tactical objectives require you to kill the warlord and offer D3. In the turn he died he gave up 3VPs. · I worried too much about the spores. They couldn’t get objectives and worst of all they didn’t give up any VP’s killing it first did not get me first blood. 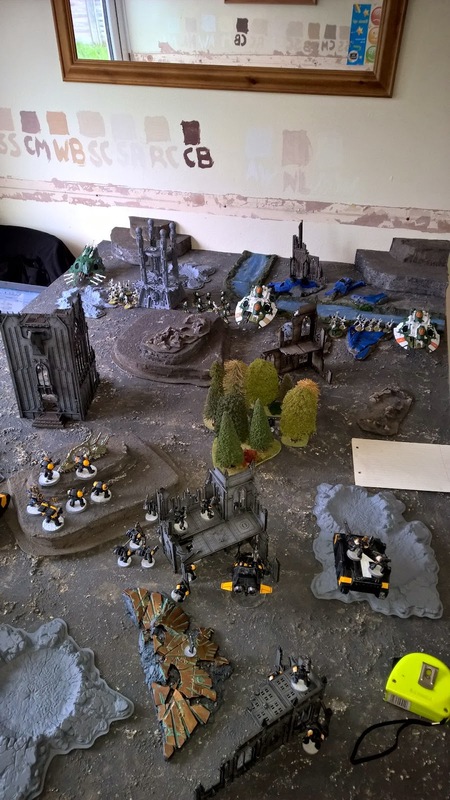 · Again the lack of solid mobile units, objective secured or not, was my opponent’s downfall. He bunched in one corner and all I had to do was bombard him. He could not go and get the other 4-5 objectives. 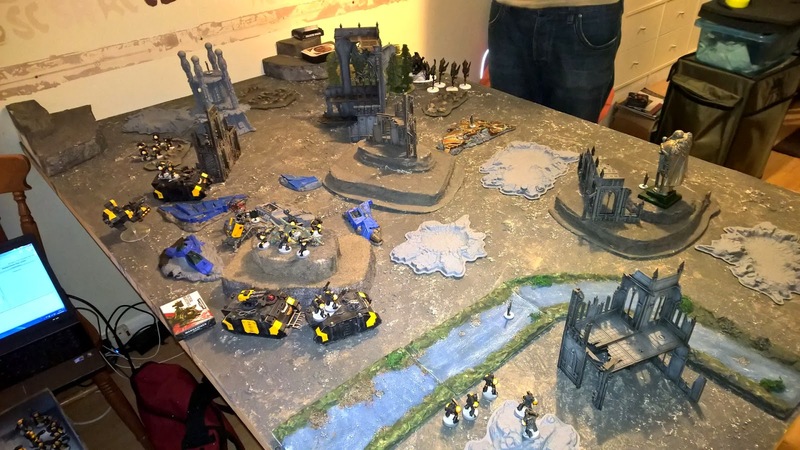 I had enough stuff to cover lots of area and on turn 4 I controlled every objective on the board. 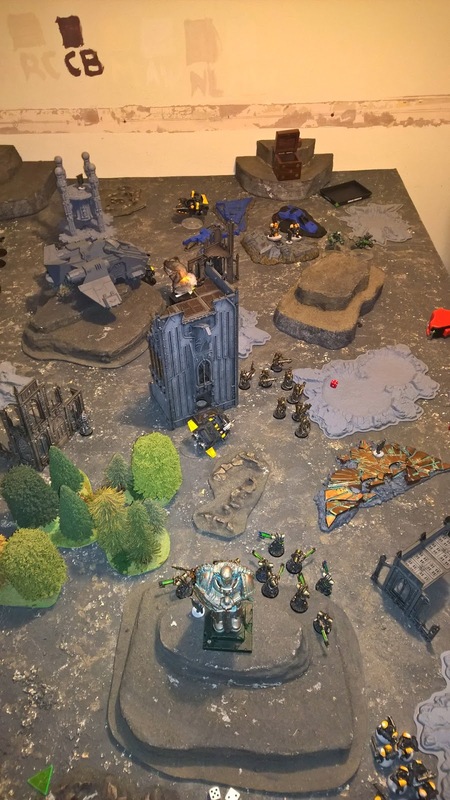 I was picking up objectives on both of our turns. It could be said I had reasonable luck in getting the objectives, but I generally covered 4-5 of them in most turns. 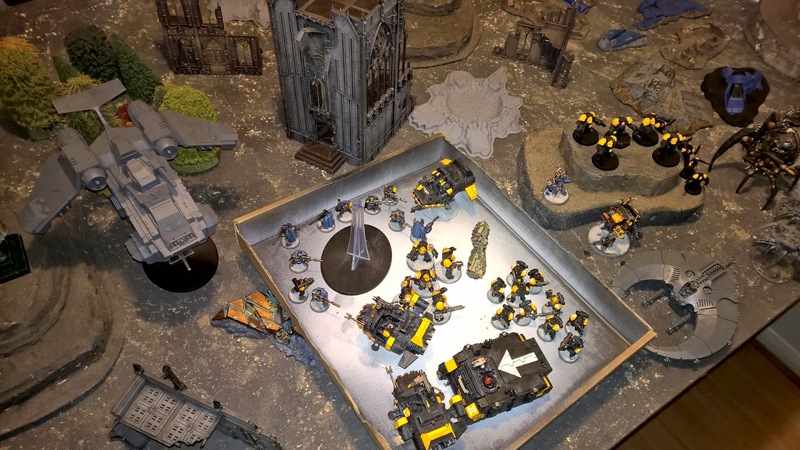 · The legendary deathstar units are a thing of the past at 1500pts. 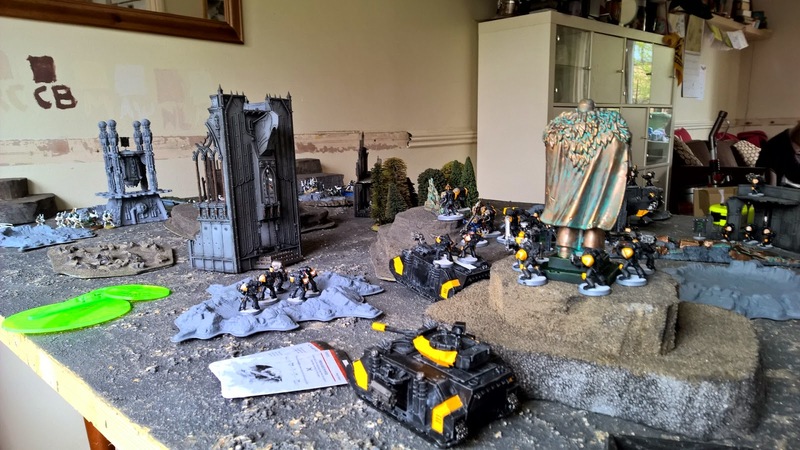 I can’t see how you can justify 450pts, for something like a land raider and a squad of assault terminators (about a 1/3rd of your army) and still have enough stuff to get everywhere. 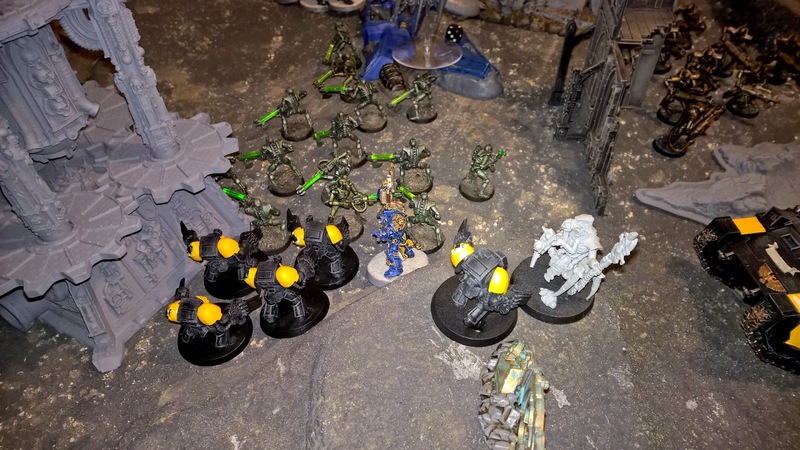 Edit: my sternguard and librarian were 372pts! · The internet whinge about a lot of things! I was out gunned 8-1 in psychic phase. Did anything horrible happen in the psychic phase, no it didn’t? Power went off, powers failed, powers were nullified. 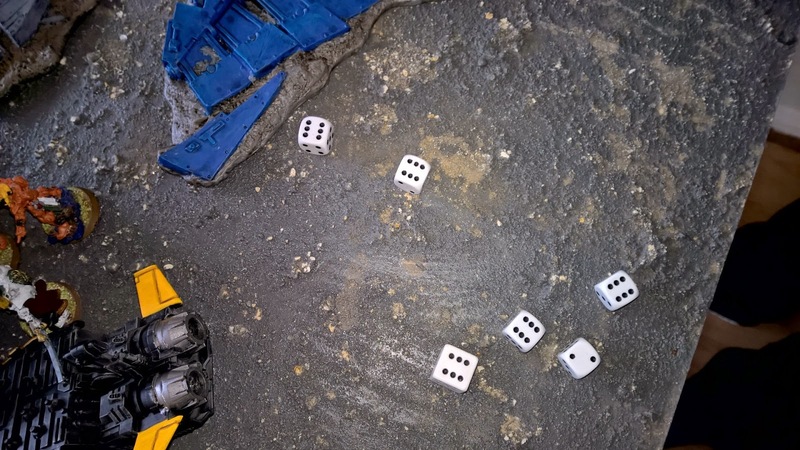 Even rolling 3 dice for a warp charge one was failing. Additionally he got half of the charges from the zonethopes who used up a lot of points that could have been spent on other things. · Net lists are they any good. 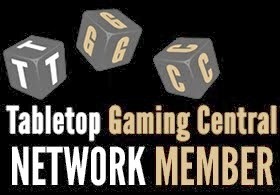 Alex played a strong net list that is doing the rounds. 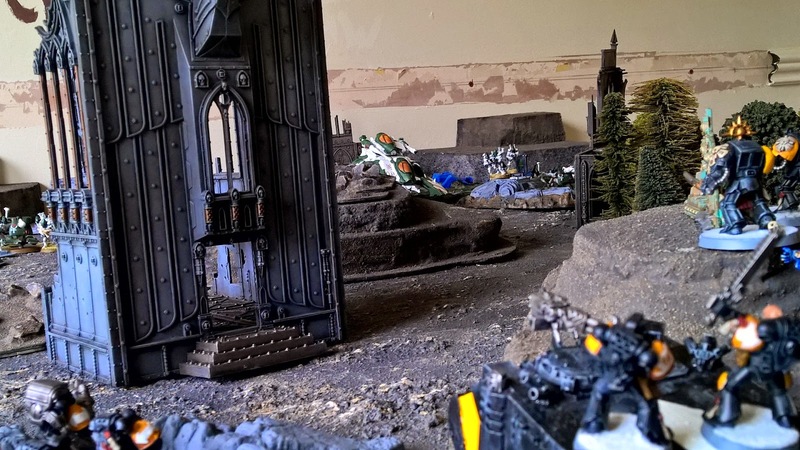 I think it would have been ok in the emperors will games. KP wise at the end I was 5-5. If we had carried on playing I had a lot of easy KPs that his flyers could have dealt with, but his venomthrope was about to go splay and his mawloc had one wound left. The aim of the game should not be to build a list that will be rock to your opponent’s scissors. I think the missions have produced a good levelling effect for this. Will we see the deathstar unit again? Yes, but not at 1500 and maybe not even 1750. 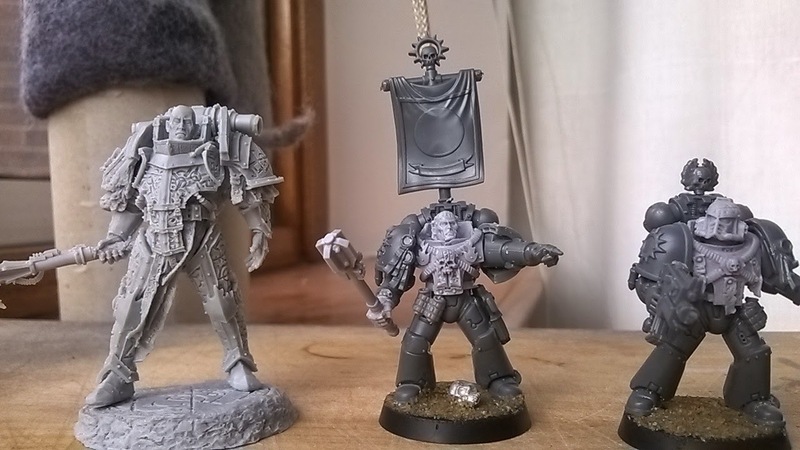 Lorgar and the Word bearers. I've had the Horus heresy itch for some time now and I have finally succumbed to scratching it. 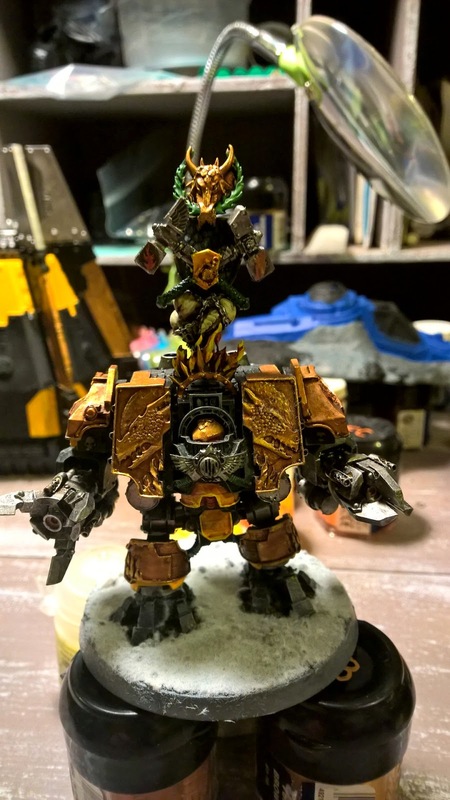 The models from forge world are great. I must admit that I am a little uneasy working with resin. It just feels so delicate. I'll explain more about that shortly. 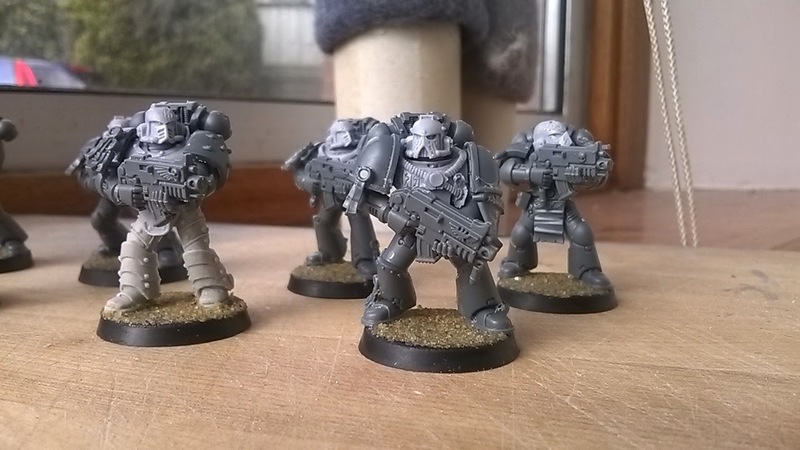 I already have some Chaos Word bearers that run with my Plague Marines, but these were done years ago. I still want to add to them but also want to portray how they were before their fall. I'll go into colour schemes in my next post when I have added some paint to them. 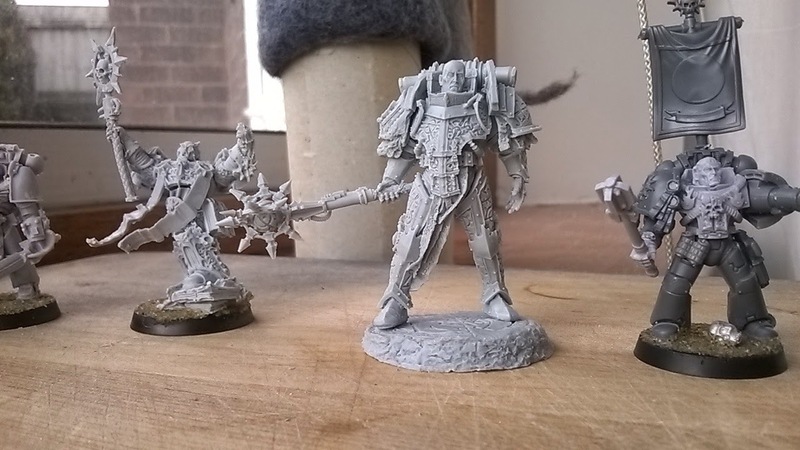 So starting with Lorgar, it would be rude not to, I found building him to be straightforward. All the bits fit well. Not sure where to attach his pistol yet, plus I have left his cloak off to paint separately. I had to make sure it would fit on by correctly positioning the haft of his great mace. The handle sits across his buttocks. The spikes on his mace gave me a headache. They are so small and come in three pieces of three spikes on each. When I was cutting the flash off one of them I managed to cut through the whole piece. I thought I had ruined it. 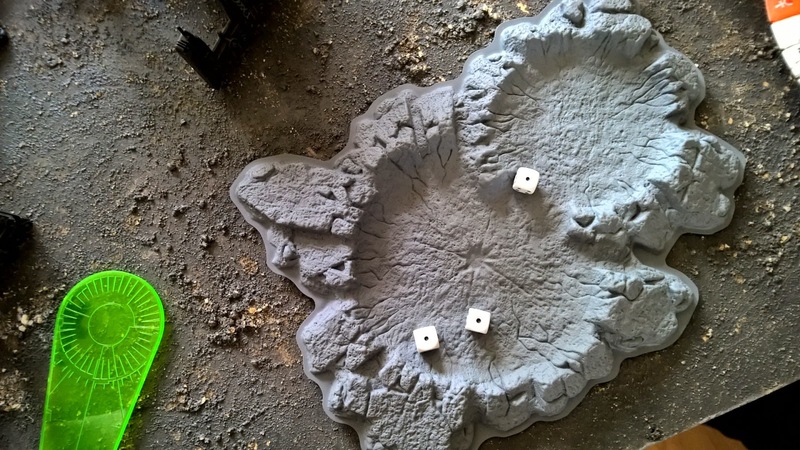 But by the luck of the gods it all glued into place. Amazing! Now I can't wait to paint him. 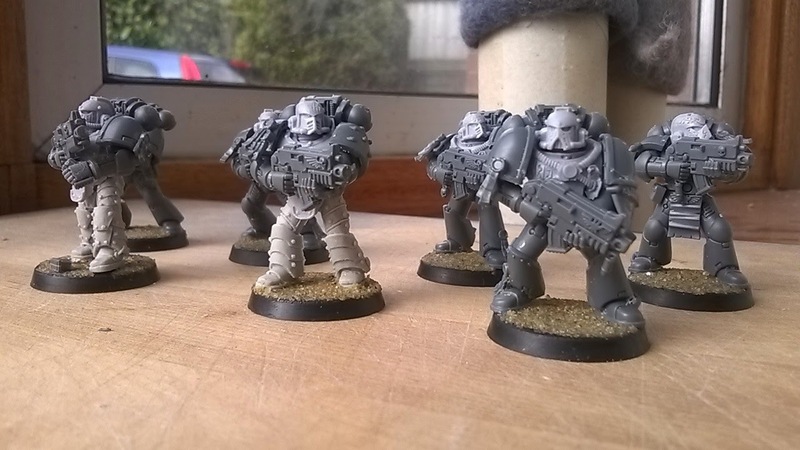 The Word bearers squad is a mixture of armour types. 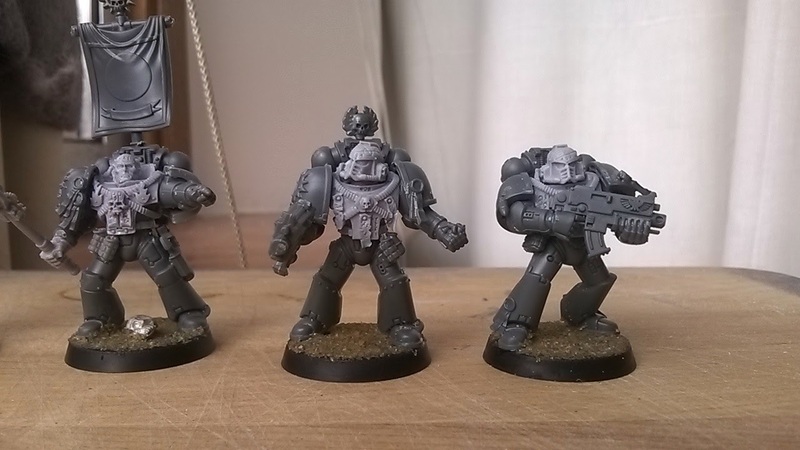 I had bought the torsos and helmets upgrade set mk IV and had two Mk III torsos spare from another set. I also had two legs from the Kromlech range. They were close in appearance to Mk III armour so decided to add these two together. 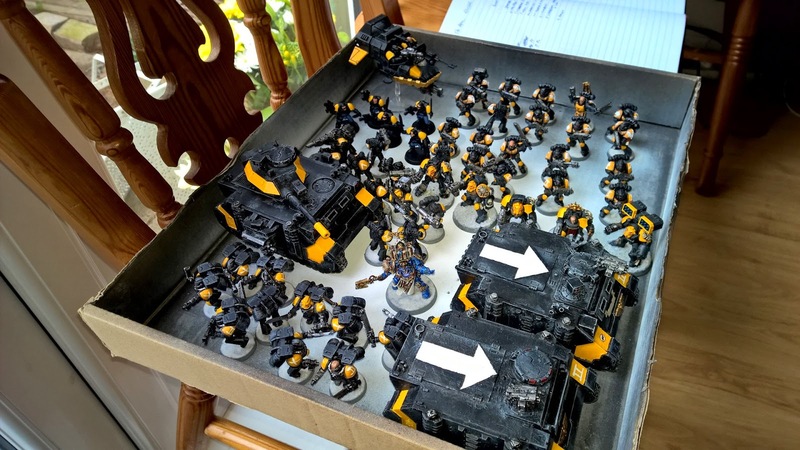 I bought the new tactical box set and used most of what I could to make them appear more akin to the heresy period. I stuck with safe poses carrying bolters across the body. I have tried to ensure the details from the upgrade torsos can be seen. The sergeant and his next in line have open poses. I gave him a power mace to match Lorgar's. 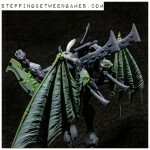 I have also built a dark apostle who can be my Erebus stand in. You will see another figure of a captain who has gate crashed the photo. More about him another time. Well, I'm pretty happy about the build and have already spray undercoated. The resulting look is more uniform. Enjoy the pictures and let me know what you think. Until next time, "By your word". 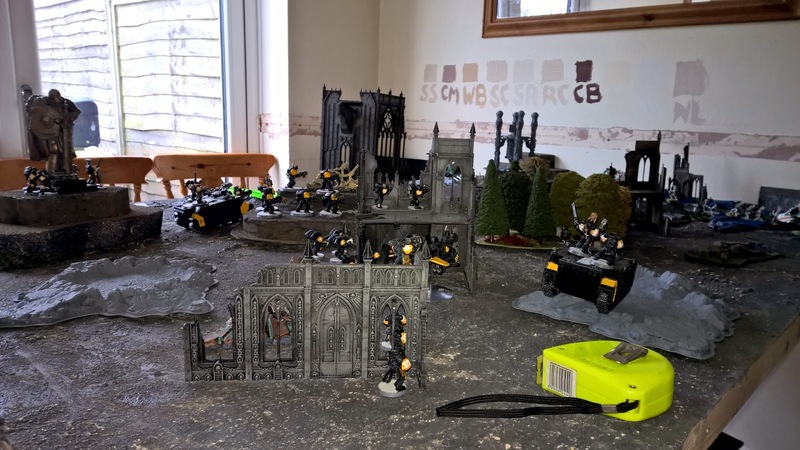 I am certainly getting good use out of my games board and scenery. 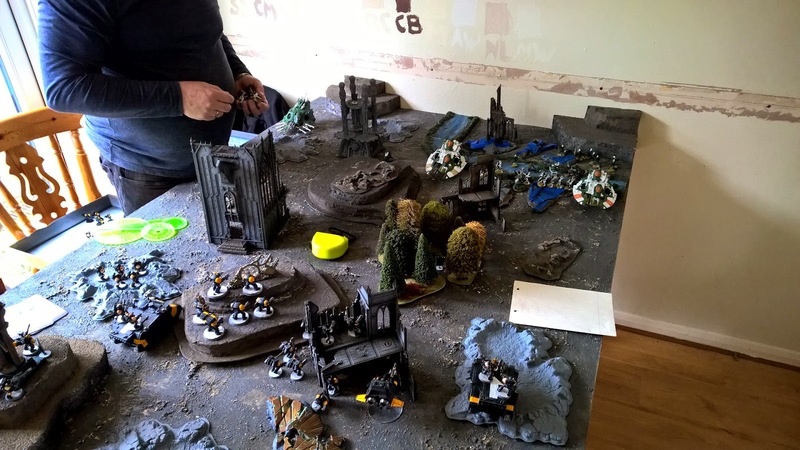 Over the Easter weekend my dad came down with his steadily growing Eldar army. I tried to field a bit of everything as this was one of his first games and he still learning the rules. This would allow him to face most stuff and get an understanding of what he would be facing. We agreed no flyers as he did not have any. We rolled for the mission and it was the escalation objective missions. 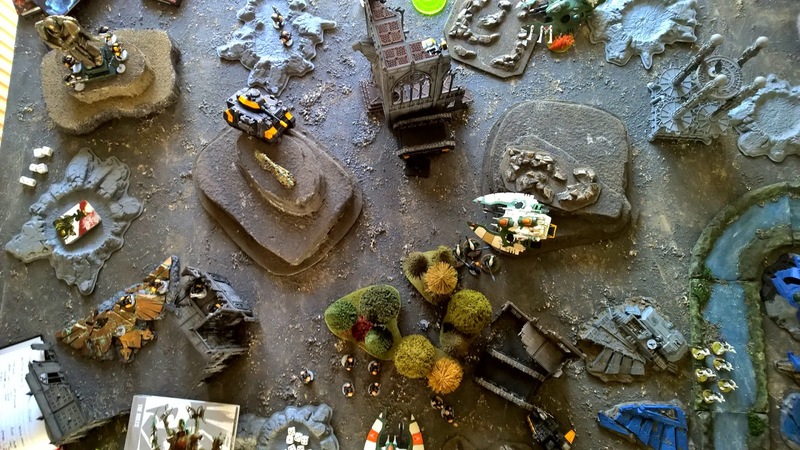 Turn 1 – 1 objective, turn 2 – 2 objectives and so on. • Forgetting I had a typhoon until turn 2, which it then stayed in reserves until turn 4! I could have done with it as in trying to get first blood I had a falcon left on 1HP and 2 missiles could have killed it. • Spirit Seer psychic checks. Turn 1 perils looses a power, turn 2 perils rolls 6, turn 3 fails to cast warp charge 1 with 3 dice, turn 4 perils rolls 6 turn 5 perils rolls 6, turn 6 fails to cast with 3 dice. 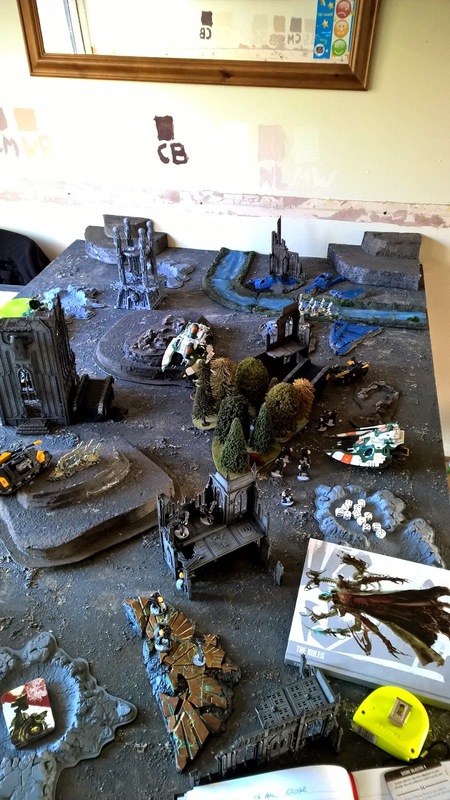 • Scouts and storm were rubbish again (punishment for scouts not being painted and using a stand in model for storm? ), combi melta failed to hit the falcon, storm gave up a VP for first blood. This is now the second game in a row where my marines did not do anything great. They did a lot of nothing really. But yet again their versatility pulled off an unlikely win. 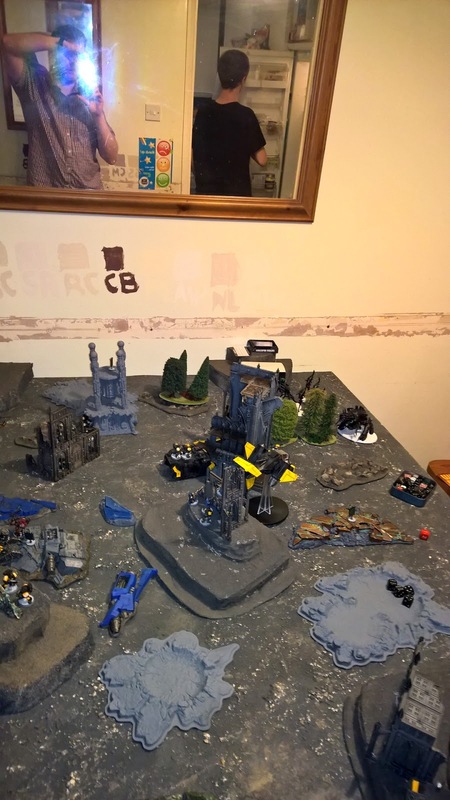 At the end of turn 2 I was 7-2 down and had just lost my terminators and warlord about a 5th of the army, and yet after that my dad failed to score a VP despite getting more cards. We did manipulate the objective cards once or twice, blowing up a building and destroying a flyer we got rid of. Generally I say we play the deck and tough if you get a duff card, but that is the luck of the draw. In the end I won 16-7. 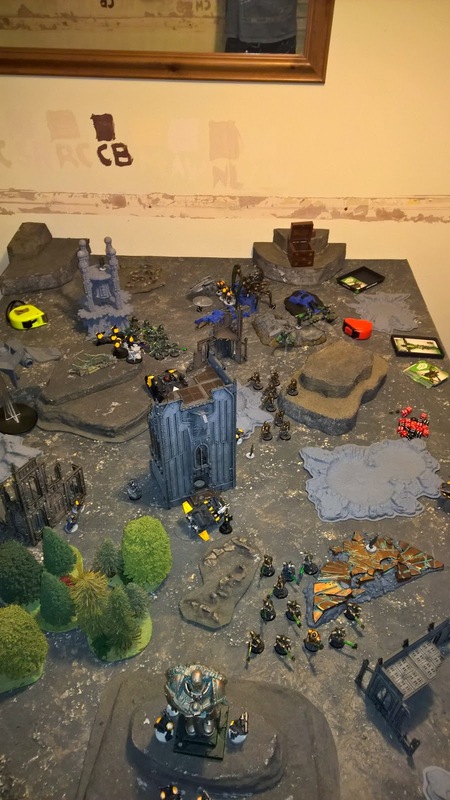 Battle report (again). Like busses, you wait ages then 2 turn up at once. This time I was up against my old sparring partner commandojimbob. 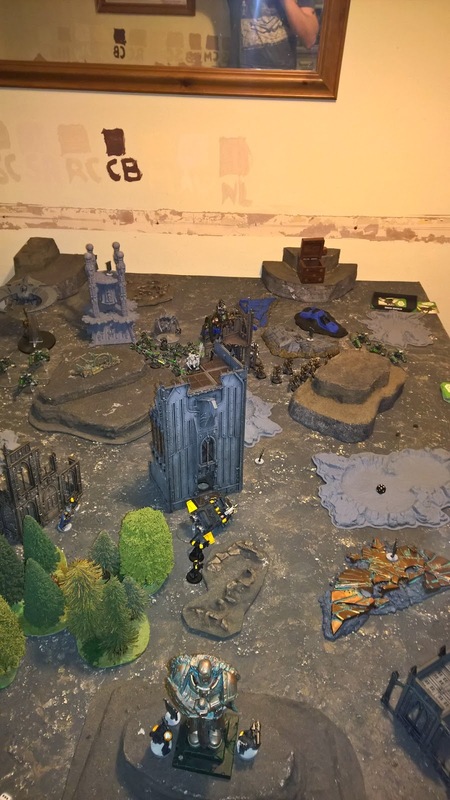 He has been out of the hobby for a while and is starting to get back in to it. 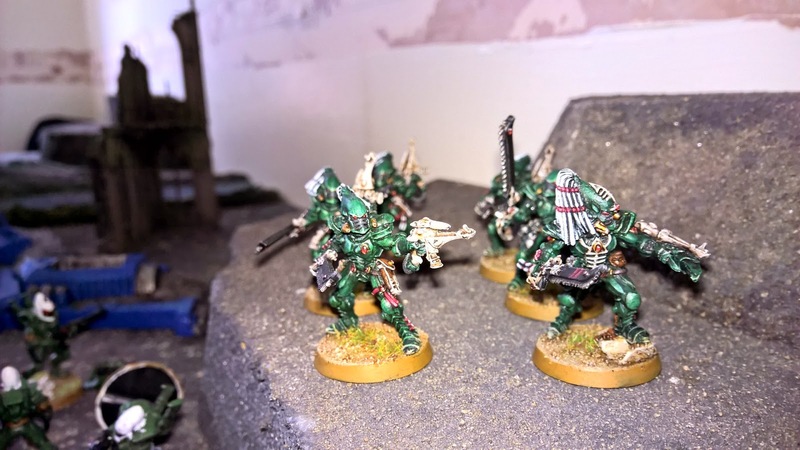 He has bought the new Necron codex and cards and fixed up his models. For my list I wanted to try out a formation. We did each choose 3 lists and rolled to see which one we played with. You should try it sometime it adds another little dimension to the game. We rolled for the mission and it was the 3 objectives and they are kept secret during the game until you claim it. I set up first. This was a bit difficult as over half my list was in reserve. All the units combat squaded and I set up on 3 objectives in my deployment zone. For the second game in a row my opponent stole the initiative scuppering my best laid plans! 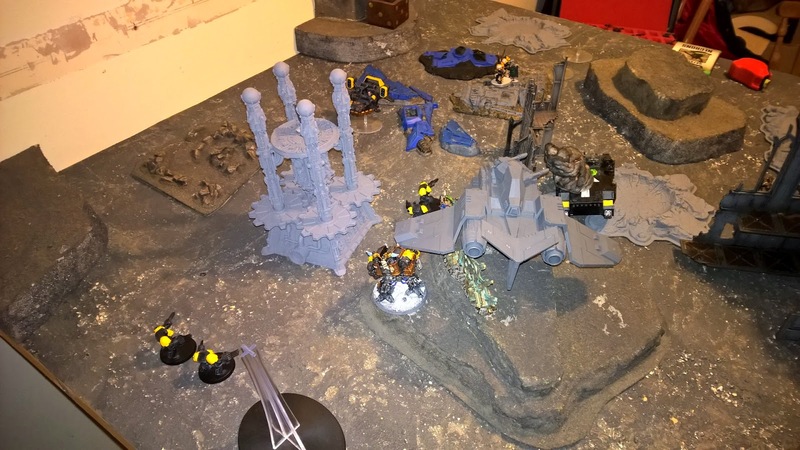 After stealing the initiative the crons immobilise the storm (I suppose it serves me right for using a proxy), but could only kill a few scouts. 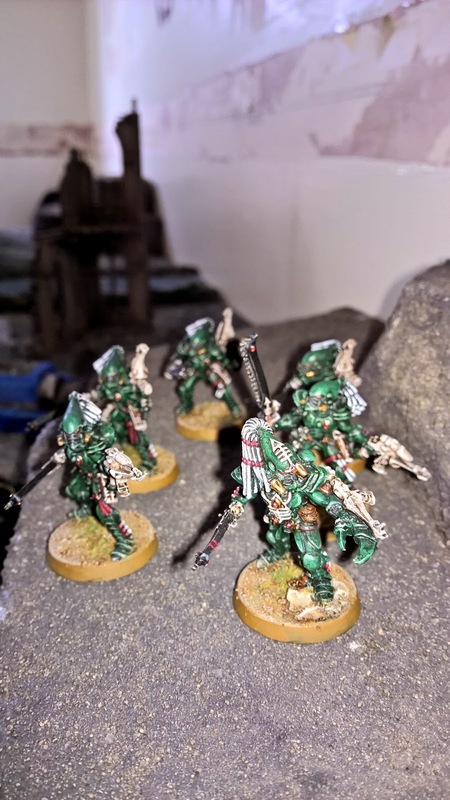 The thing with necrons is that they only have short range (24” or rapid fire)) weaponry so I had chosen plenty of long range stuff like missile launchers. 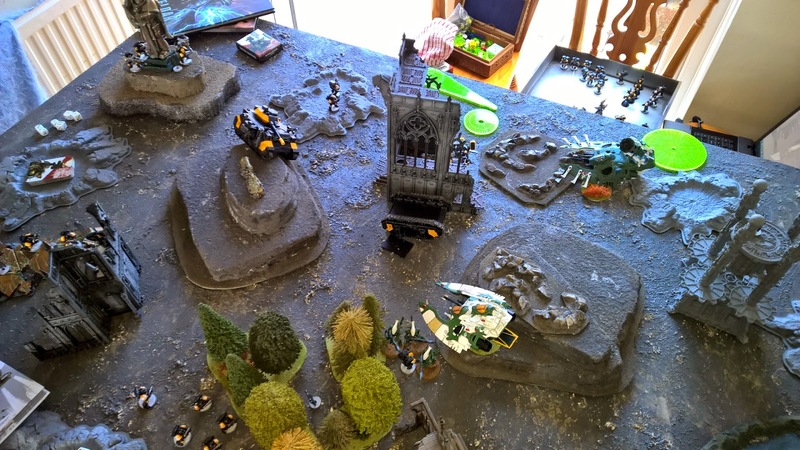 The typhoons did their job and with 4 krak missiles took out a spider.... first blood. The Necron reanimation is very useful for them as it is basically an additional inv save! He also passed some low morale checks rolls. The game was close throughout. Over all I am not sure how I won. My marines were very poor. No one unit stood out to have done anything useful. The typhoons killing a spyder on turn one was a standout moment. 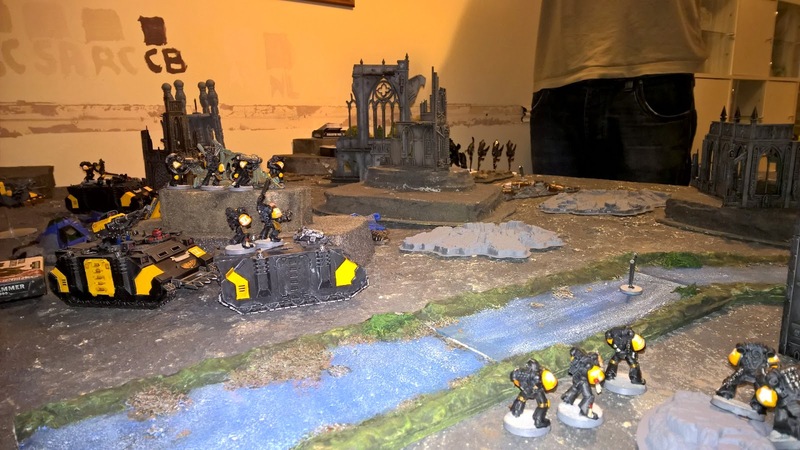 But the terminators (both squads) were poor. 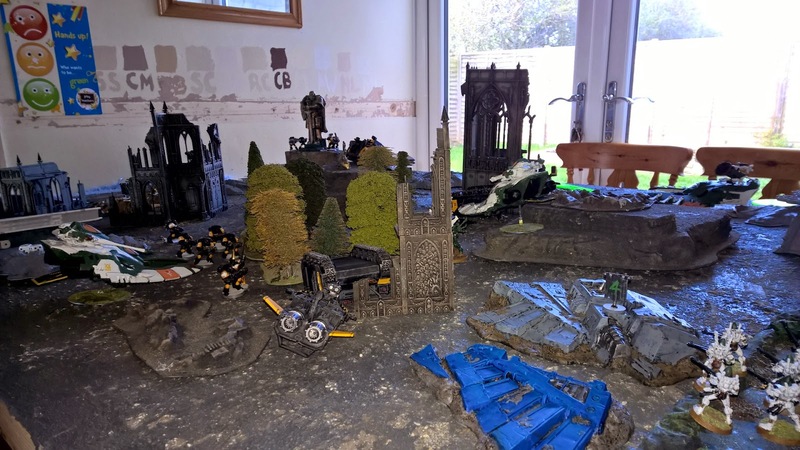 The storm was immobilised turn 1 and the scouts couldn’t hit a barn door. 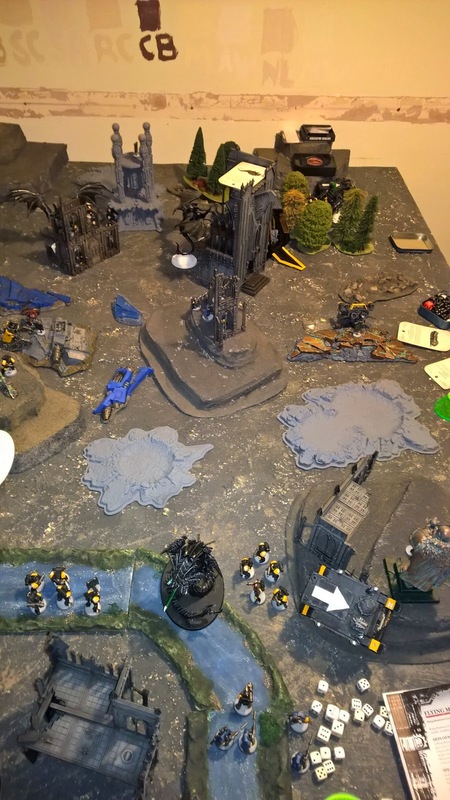 The Raven made little impact, but I suppose the versatility of the marines and my great commanding won me the game! Next is a painting update in a few days and hopefully more games in April.